It always makes me laugh that each year this is the most popular post on the blog, the reveal of this year’s Jammie pants. 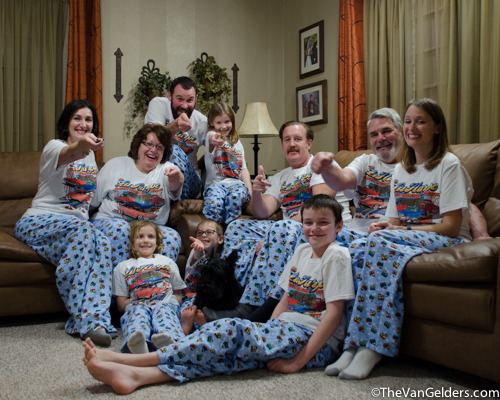 For any newbies, my mom makes matching pajama pants for my entire family each year. This year we are once again wearing the t-shirt that features my pop’s award winning 64′ Ford Fairlane; it is paired with a little choo choo train patterned flannel. Last year they were “Paw-jamas“, this year it was Planes, Trains, and Automobiles (a favorite holiday movie for us all). And then one of everyone pretending to have the remote. 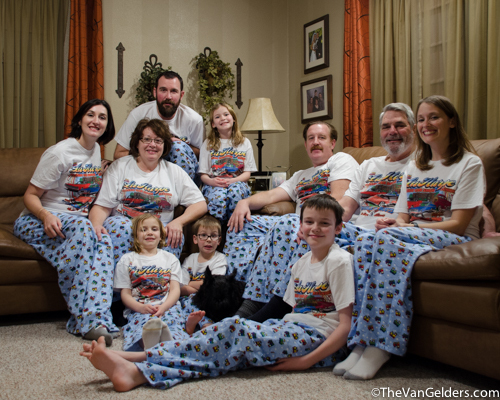 This entry was posted in Photography, Seeing Family and tagged Christmas Jammies, Funny Family Photos, Matching Jammie Pants. Bookmark the permalink. As a sewer, I can appreciate all of the hard work that went into this endeavor. You all look fabulous. It is a great deal of work. She actually buys the fabric a year before to make it easier. Works a little at a time.